Featured Race - Running Easy - "Try Easier"
Our featured race is the Mandela Day Marathon because this is a race that has the potential to "have it all". There are many, many marathons in the world and many, many marathons in marathon made (that's a lot of m's ;-) South Africa. However I am excited about the Mandela Day Marathon as I explain in my blog post - "THE marathon of South Africa". I suggest that this race has the ingredients to become the iconic marathon race of South Africa like the Comrades marathon and the Two Oceans marathon have done for ultra-marathons. Running is more than just the distance run - which in itself is a huge achievement, but it is what the race means to those who participate. How incredible is a race that reminds us of someone who selflessly struggled against oppression in a spirit of humility. How incredible is the opportunity to visit key places in this struggle and share it in a very real way as you run the hills that dominate the race as it makes it way along it's meandering 42km course. Although 2013 marks just the second running of the Mandela Day Marathon, it is rooted deeply in Nelson Mandela's journey to bring freedom to an oppressed country. The race starts at Manaye Hall in iMbali where Madiba made a surprise appearance at a gathering that was happening there, even though he was a wanted man. This day on the 25 March 1961 was to be the last public speech he made before he was finally captured at Tweedie on 5 August 1962 - where the race ends at what is now known as the Mandela Capture Site. The race climbs the steep hills between these two significant places and reminds everyone participating of both the struggle he fought but the power of comradeship that is always present in a marathon. 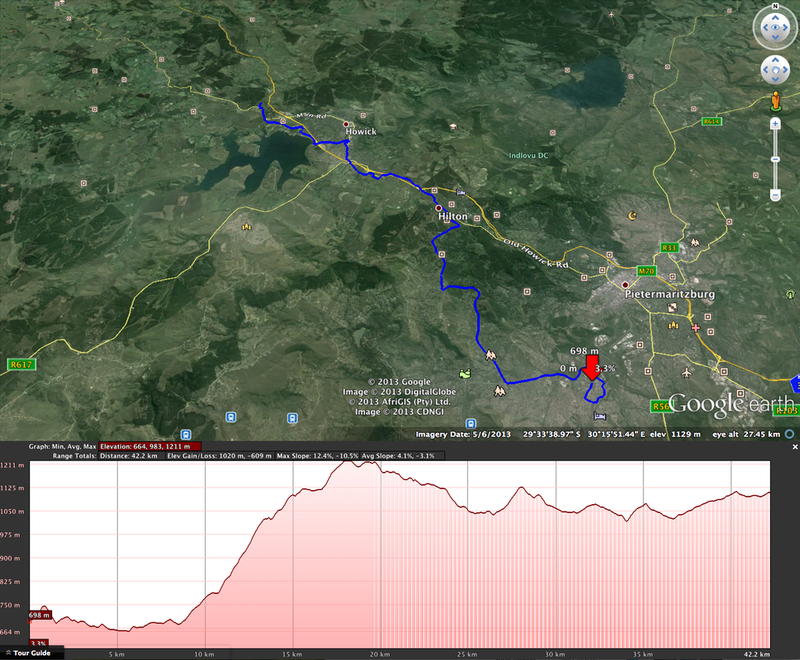 As can be seen from the route profile below this race is no "walk in the park". 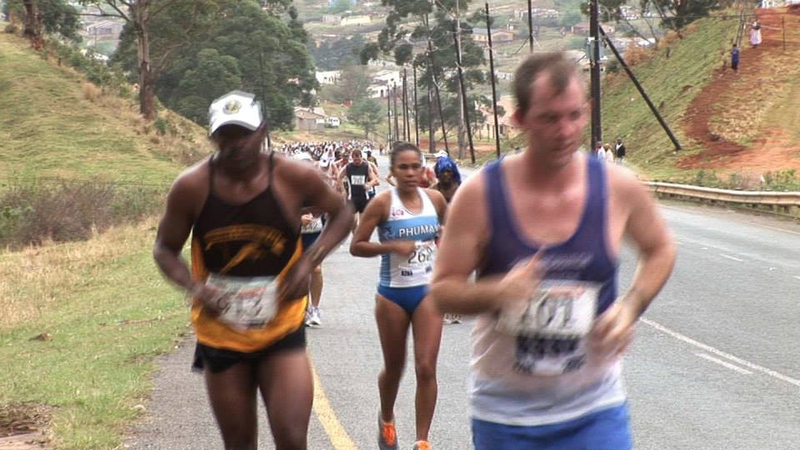 The first half has an elevation gain of over half a kilometer (550m) which is certain to remind the runners of the reality of what Mandela's struggle was all about. Thereafter it's a long undulating road to the end which for many, after having their legs sapped of energy - will be the long walk to freedom. The total elevation gain is 1020m - that's over 1km, with the steepest slope being 12.4% which means I might need to bring my grappling hooks and climbing equipment to summit it. Beside the standard marathon there is a also a 10km race and events geared to accommodate athletes from various age categories, abilities, and including a 4.6664km Kiddies Race and a wheelchair race. This year Mandela Marathon Race Organising Committee has also included an International Cyclist Race. There is also the VIP Elite 4.6664km race which sees the MEC and even members of the Mandela Family taking part. Enter your email and we will send you the scientific facts about running. You will find out why scientists are saying you should run. Get the 10 Scientific Reasons why running is the best thing for you - It's mind blowing! We will even include the original sources should you wish to read more. PLUS you will get a 50 page book on how to train, using the Running Easy approach to run your first 5km/3mi race.